So. I'm glad you liked the pastry post, because that is the kind of thing I can do on a semi-regular basis: quick, sloppy, and without editing. Thus, behold: blurry pictures of our lotion bars. Ella and I love these. LOVE them. LOVE. If not for these, I'd probably have to live in a bubble because my hands would be so cracked and damaged that I would be too susceptible to infection to live in the natural world. the prettiest of the pretty dishes that I use to feed the cats. You're worth the effort. OPTIONAL: essential oil for fragrance, or Vitamin E oil because your daddy liked it. YDMV (Your Daddy May Vary). ALSO OPTIONAL: colorant. I never add that, because I'm lazy and forgetful. Vitamin E oil: beauty supply store. 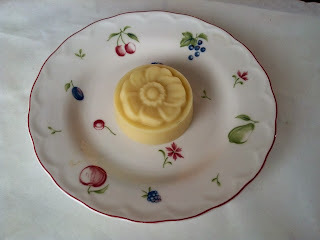 Block of beeswax: beloved friend, but I'm sure you can find it other places. Pithy instructions: double boiler. Melt beeswax. Add the other stuff. Stir, pour, let cool/harden. 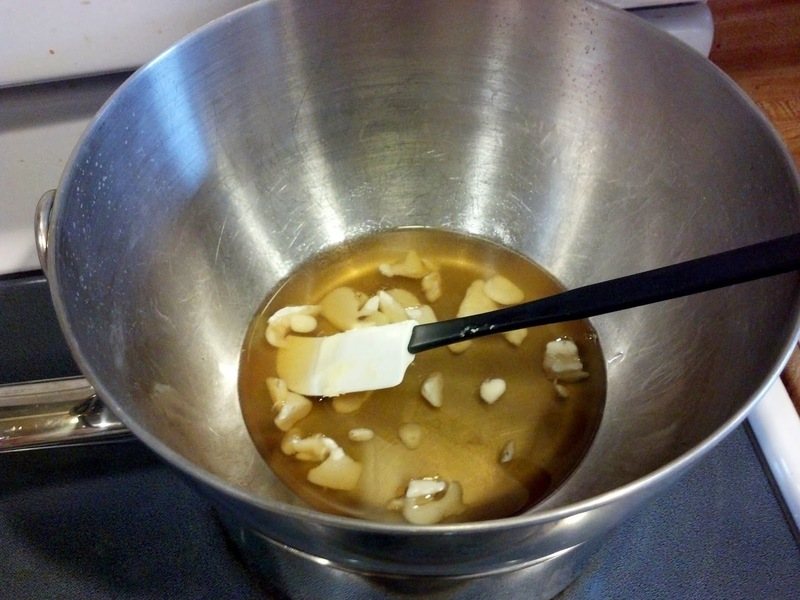 A double boiler doesn't really do double boiling. 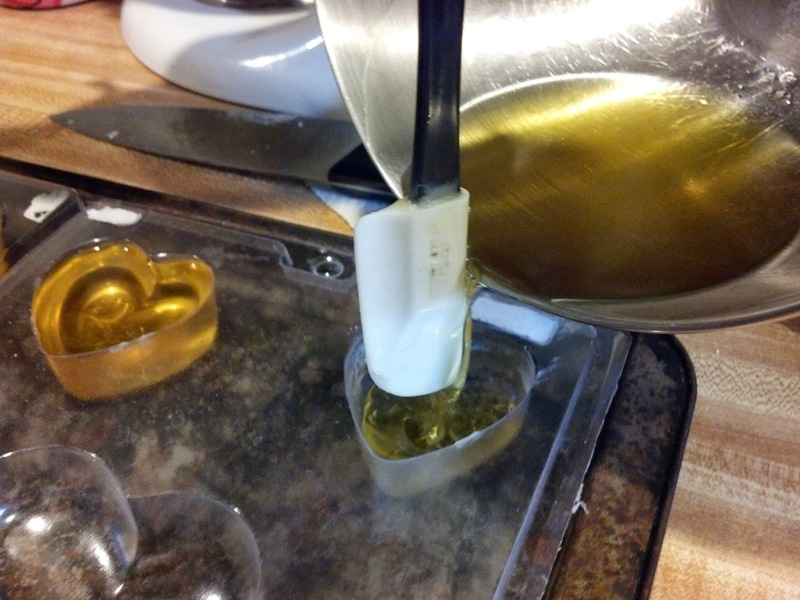 It is a two-tier set up that holds the ingredients one step removed from the heating element. If you have an actual double boiler, kudos! You are clearly an advanced kitchen technician. 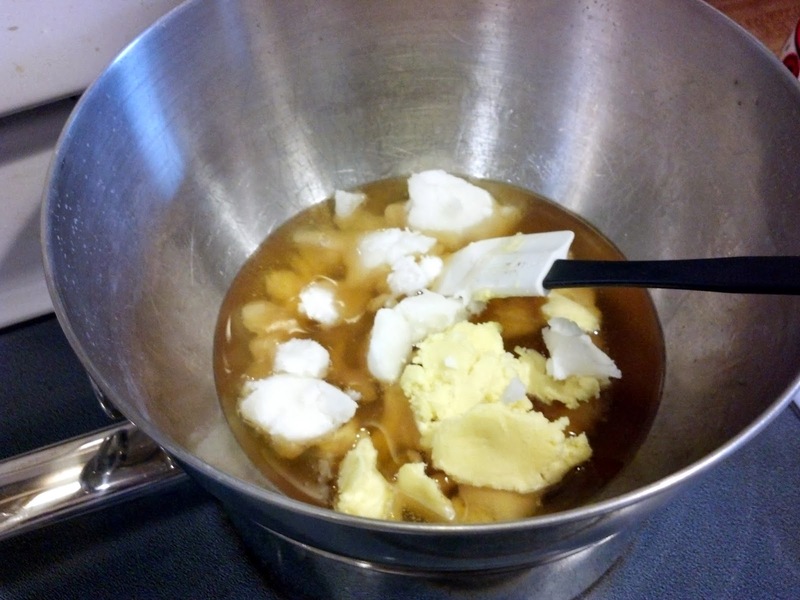 If you do not have a double boiler, kudos! You have not spent your hard-earned money on extra equipment. 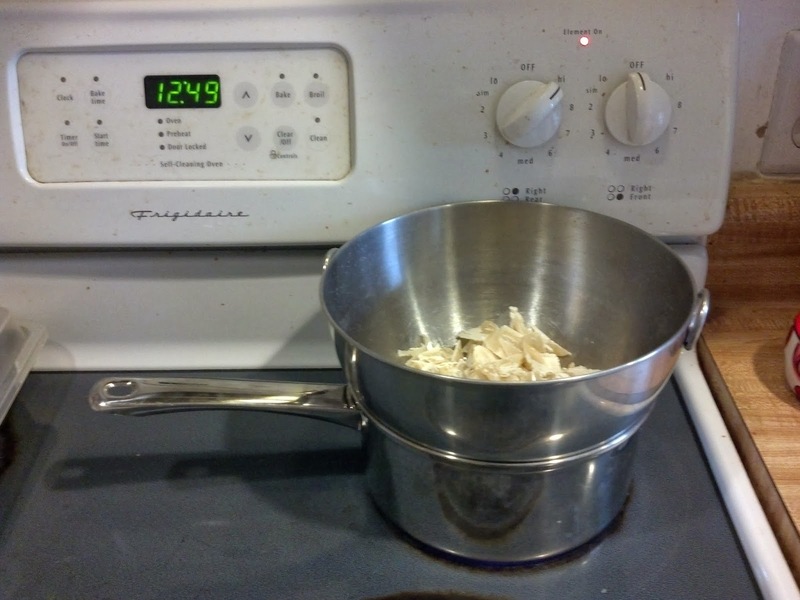 My double boiler set up is a metal bowl on a pot of water. Sunday, 1 December, a little after lunchtime?" Put the beeswax chips in the double boiler and DON'T WALK AWAY. Hot wax fire bad. Just stand there stirring and admiring your double boiling prowess. When the wax is almost completely melted, dump in all the other stuff, GENTLY, because hot wax splatter burn bad. For some reason, I was surprised that melted beeswax was the color of honey. How much Vitamin E oil? As much as you want. Last time I used a modest squirtful. This time I used a healthy squeeze. 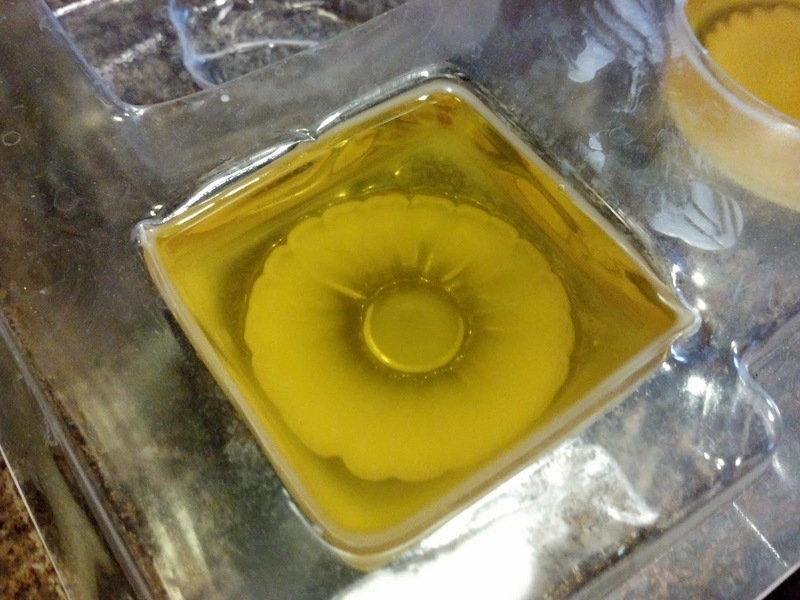 While it is melting, set up your molds. 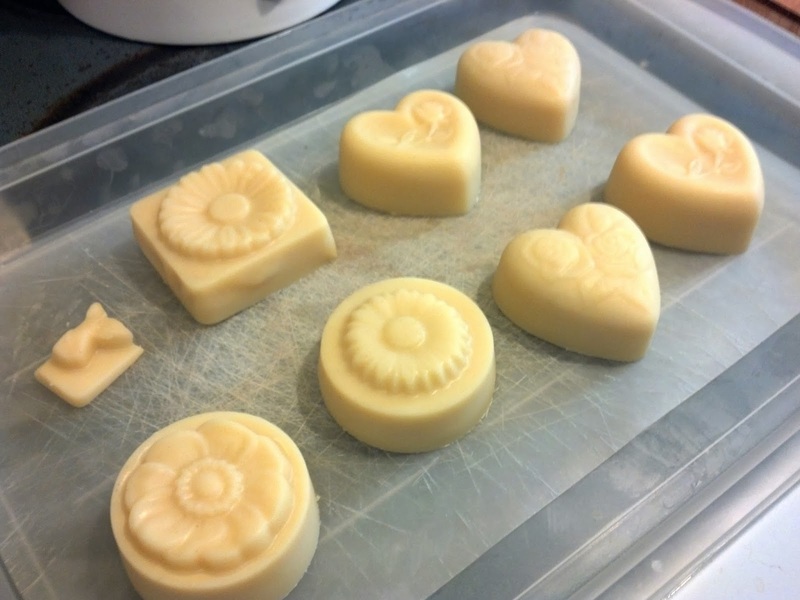 I use soap molds because I have them, but you can use anything that can take the heat: muffin tins, microwave-safe storage containers, etc. 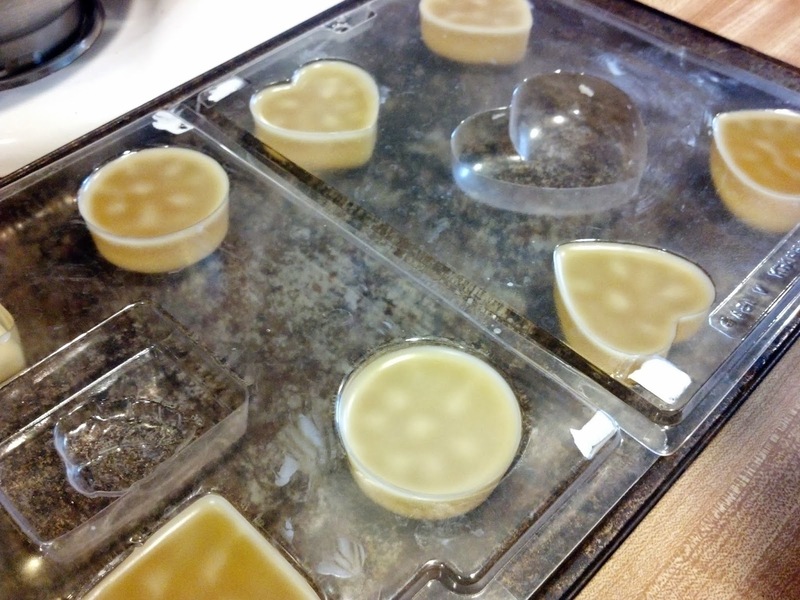 If your mold is too big for your lotion bar taste, you can always cut the bars to size once they cool. Nothing to use for molds? OK: you can pour a solid layer into a rimmed cookie sheet, then use a knife or pizza cutter to cut bars, or use cookie cutters to make all kinds of pretty shapes. You can re-melt any leftovers and pour again, or you can just dump them in a bowl and use them as is. Or you can do something else which I'll show you in a sec. When everything has melted together, pour the mix into your molds and let it completely, utterly, undeniably cool till you have a solid mass that can't be squished when you put your finger in the middle of it to unmold. Or so I've heard. you can direct the liquid straight down into the container. This works for pretty much all pourable liquids. I know, I know: MIND = BLOWN. and in the pretty parts of the mold. Don't jiggle the tray! Or you will be sorry. MARK MY WORDS. Yeah, watching lotion bars harden is almost exactly as much fun as watching paint dry. When they are good and cool and hard and solid, pop them out. That little chip in the corner is special, in a good way. Alrighty, you're done molding and cutting and you have a little extra--like that little chip in the corner of that picture, which was originally just a few spoonfuls of liquid that I poured into one of the molds. Remember the cookie cutter leftovers I mentioned? 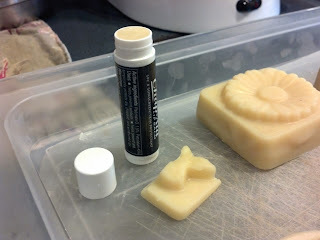 Here's what you can do with them: melt them again, then pour them into all the empty lip balm twirly thingies you hoard because you can't bear to throw out a perfectly good twirly thingie. 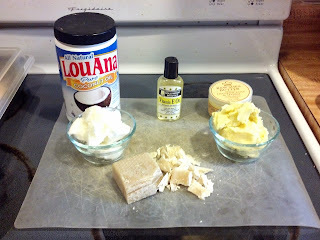 before pouring the melted lotion into it. And use a chopstick for the pouring trick. We bag and tag our bars and store them in the freezer, because this is the South and it gets hot enough in the house in the summer for coconut oil to go to liquid. But the bars are safe at room temperature for least two years without refrigeration, and possibly longer. What I need now is to figure out a good gift presentation for these bars--suggestions?